Great grants training - at your fingertips! Let's grow your grants success ... together! Tell me something: Is this you? You're ready, right now, to make a new commitment to your grants success - to getting started ... getting better ... going deeper. And you're willing to think differently about your grants work, dig in, learn a ton, work hard, and start seeing real success - right away - no matter where you're starting out. And you'd value the opportunity to work with a long-time grant professional (and grantmaker) who can guide you step by step through exactly what it takes to turn your good idea into an A+ grant proposal ... every time. If your answer is "Yes, that's me" - you're in the right place! At GrantsMagic U, you’ll learn how to navigate the ever-changing grants world with skill, confidence and success – so you can make your difference in the world. We start with your inspired vision for change. 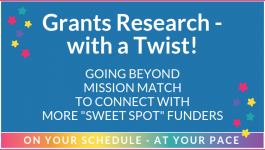 Then we strip away the mystery … unlock the magic … and reveal the roadmaps and step-by-step planning tools you need to turn your good idea into an A+ grant proposal that will have the right funders saying an enthusiastic "Yes please!" That’s the “magic” of GrantsMagic U – when your vision connects with know-how and transforms into something real and valuable in the world! Get Your "Magic Wand" here - free! OUR MOST POPULAR, POWERFUL VIDEO TRAINING - FREE! A one-page grant proposal? It happens – with the right planning. This free-to-everyone, on-your-own-schedule video-based training introduces you to GrantsMagic U’s “Magic Wand” – the deceptively simple one-page proposal template whose 10 “Magic Wand” questions have won grants of $2,000 … $30,000 … $144,000 … and more (MUCH more) – for nonprofits like yours. It’s the single most powerful tool in the GrantsMagic U toolkit – and it’s yours free right now, no strings, no waiting … as our gift to you! You say you're a total grants newbie? Start with our free "Magic Wand" video training! That's what Bill, Elise, Matt and hundreds of others did... and got their very first grant awards! Want to build your practical skills in successfully navigating the grants landscape? We've got you covered! Check out our on-your-own-schedule mini-courses on the most popular grants topics. 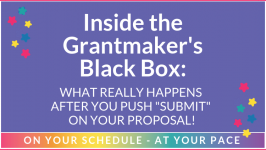 Ready to make a deeper commitment to your long-term grants success? Maybe our all-in-one at-your-own-pace course The Ultimate Grant Proposal Blueprint is right for you! Wherever you're starting out, as a member of the GrantsMagic U Community, you'll be part of a virtual global neighborhood of more than 5,400 people just like you - looking for the best, newest, most practical, most down-to-earth, most thought-provoking grants success tools and resources. Membership does have its privileges - and it's always free. Check out your member benefits and join! Sharpen your grants skills and deepen your understanding of the grants world - all from Maryn's unique 3-D, behind-the-scenes perspective! Each of our five-star video-based mini-courses runs 90 minutes to 2 hours and comes loaded with the step-by-step roadmaps, checklists, worksheets, planning tools, and fill-in-the-blanks templates to meet you right where you are and take you to your own next level of success. BEST DEAL! Sign up for our 7-course VIP bundle and get all 7 courses instantly, for just $129 - that's 50% off!